Semuc Champey is one of the must visit places in Guatemala. The place is where the river hides under the stones. Basically, Semuc Champey is a natural bridge with fresh cold water pools on top of it. It is a must visit place in Guatemala after or before visiting Tikal Ruins, Old city of Antigua, Lake Atitlan or climbing Tajumulco volcano. What is Semuc Champey in Guatemala? View to Semuc Champey pools from El Mirador. As I said before Semuc Champey is one of the must visit places in Guatemala. The place is made from natural limestone bridge. On top of the bridge tourists and locals enjoy cold and fresh water pools. They are connected to each other by small waterfalls. Under the natural limestone bridge passes Cahabón river. Semuc Champey is located in Alta Verapaz department, Guatemala. Most of the visitors stay in Lanquin and take a short ride to the pools from the town. Natural pools are located around 500 meters away from the entrance to the sight. There is an entrance fee to visit natural wonder of Semuc Champey. Price to enter natural pools, hike to El Mirador and enjoy the facilities is Q50 per person. This price is for foreigners and it doesn’t matter if you are a student, child or adult. It stays the same. 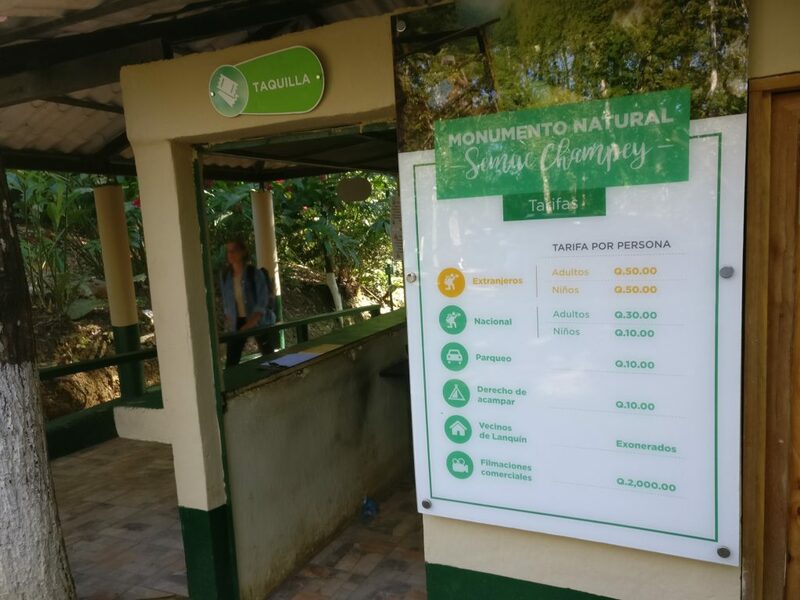 Entrance fees for Semuc Champey. Local adults pay Q30 per person and children Q10 per person. Parking is Q10 for a car. If you want to camp in Semuc Champey it is additional Q10. If you plan to do commercial video shooting be prepared to pay Q2000. On the way to El Mirador. 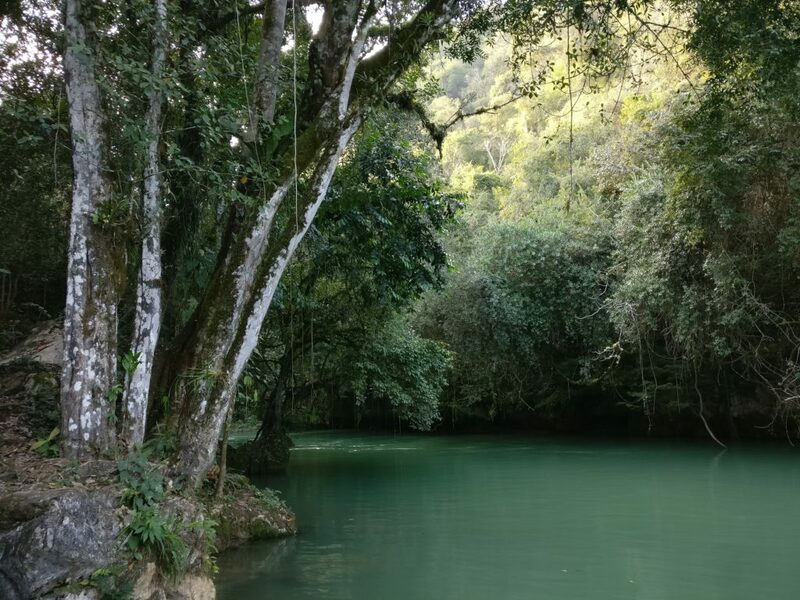 Once you enter Semuc Champey and continue to walk along the path you will notice a sign on your left side which shows the way to El Mirador. Take it! 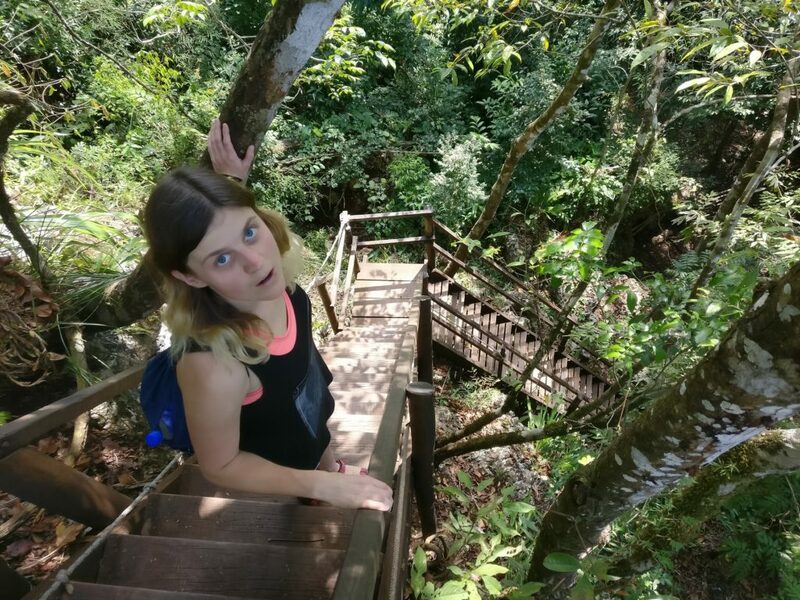 It is a moderate 30-40 minutes hike through the jungle. Mostly it goes up the wooden stairs and ladders. Have plenty of water with you! 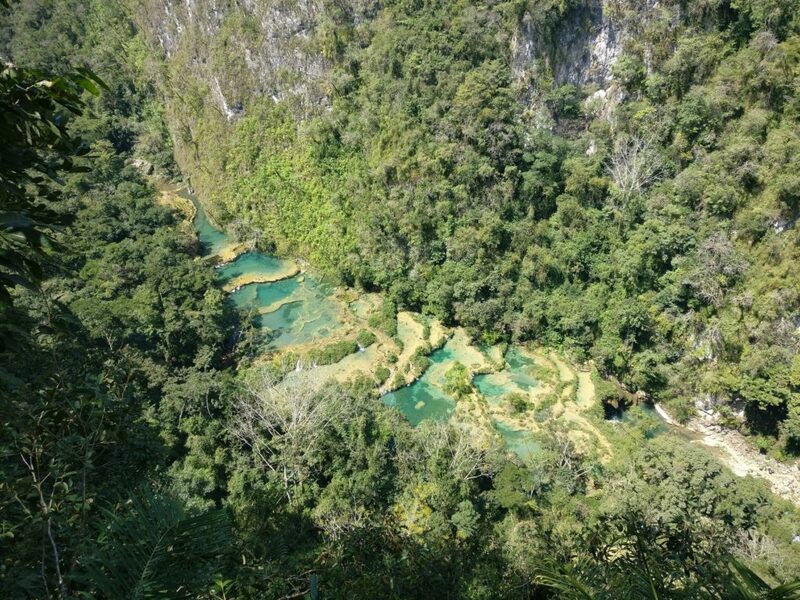 El Mirador is a wonderful viewpoint where you can see all of the Semuc Champey natural pools. After short activity it will be much nicer to jump into cold fresh water! Where to Stay at Semuc Champey? 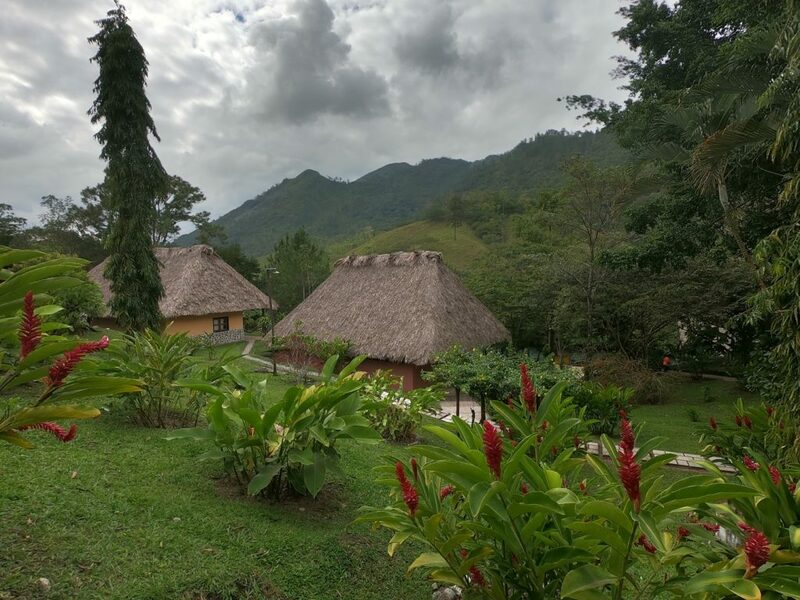 There are plenty of accommodation options around Semuc Champey. If you want to stay near the pools I recommend thinking about Utopia Eco hotel. They offer dormitory rooms, private rooms and camping. El Retiro hostel in Lanquin. Another option, which we actually chose was to stay at Lanquin town. Lanquin is about 30 minutes ride away from Semuc Champey and it offers more options for accommodation, food and activities. You can visit Lanquin caves, have a nice pizza and go tubing in the river. We stayed at El Retiro which I can definitely recommend! Located near the river El Retiro offers tubing and nice dinners. They have pool table, old school video games, table tennis and other fun activities. Accommodation options include dormitory and private rooms. Visit Lanquin caves. Interesting and long cave with a lot of bats inside. Some tours come in the evening when the bats are coming out. Entrance fee is Q30 per person. Visit K’an Ba Cave where you will have no flashlight or special equipment. Have your swimwear and you will get a candle with which you will explore the cave. Located near Semuc Champey. Go river tubing. Most of the hostels in Lanquin or Semuc Champey will offer this adventure. Be careful as the current might get pretty strong in some places! Enjoy good food in restaurants or hostels around Semuc Champey and Lanquin. Swimming in the river or Semuc Champey fresh water pools. Not the safest ride I have taken. If you made all the way from Lake Atitlan, Antigua or Quetzaltenango to Lanquin, then this is a last and shortest trip leg. 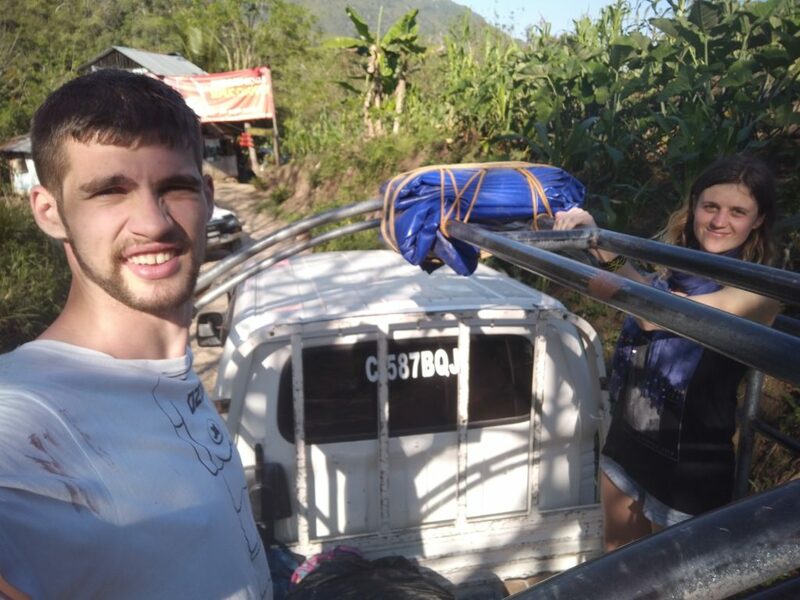 Many small trucks leave from Lanquin to Semuc Champey every 20-40 minutes. Most of them leave in the morning. Probably you will need to stand in the back of pickup car. Price from Lanquin to Semuc Champey varies between Q15 and Q25 per person. We paid Q11 per peson on the way back because we didn’t have more money. So I guess if you are a tough negotiator you could get this price to Q10 per person. Enjoy your stay in Lanquin and Semuc Champey. If you have any questions – do not hesitate to ask in comments section. Any advice is also welcome!